Poster sessions are a form of papers presentation, within which authors and interested participants in a free manner discuss paper results. 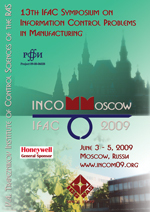 In accordance to that, authors are invited to prepare their posters in a form which would be maximally able to reflect the papers entity, emphasizing basic features of the contribution, so as any symposium participant could receive proper information on the papers and formulate relevant questions to the author. At the symposium, each poster session is preceded by a half-our coffee break; thus duration of the poster sessions is one hour. The poster format is A0 with vertical orientation. All tools for poster fastening will be provided on site.